Before meeting Tom Ashe and becoming part of the Favela Brass project, I had only been in Rio de Janeiro for several months and was already starting to feel like my time in Brazil lacked substance. Although my social life was improving and English teaching work was finally rolling in after a frustrating pre-Carnaval job search, I felt unsatisfied. Aside from the occasional jam session, I wasn't doing enough with music, and artistic inspiration seemed hard to come by. I also wasn't doing any sort of volunteer work as I'd hoped. Worsening this sense of dissatisfaction was my living situation. I had an insanely OCD landlord named Newton, who wrote notes on the walls when we didn't do the dishes or sweep the floor, and checked in on us at random hours to make sure we didn't have guests staying over free of charge. Not to mention, the 100-year old mattress I slept on, or lack there of, was giving me back pain. While I love the sandy coast, being a 5-minute walk from Ipanema beach was not enough to assuage my discontent. My friend, Ben, coming to visit me from the states for several weeks was a significant turning point. His butting heads with my crazy landlord made me realize how ridiculous my living situation was. I became so fed up with the bickering and lack of sleep, I didn't care if I was only midway through the month's rent. I wanted out! And I wanted my friend to see something better than that nonsense. Ever since meeting Tom at a Santo Scenarium big band concert, I had contemplated the idea of moving to his place and helping with his project. The problem was I had just paid for two months rent when we first met and the idea of living in a favela made me slightly uneasy, so I never seriously considered moving and fully dedicating myself to the project until this moment. But it suddenly seemed like the ideal move. When I visited Tom's place to talk logistics, not only was I was relieved to see I'd finally sleep on a real mattress in a comfortably sized room and have all the necessary amenities, but also excited to learn about his plans for teaching the kids. We weren't going to just shove a trumpet in their faces and tell them to play. In fact, mastering a brass instrument was the final step. Instead, we were going to help them experience something that most children around Brazil do not: a well-rounded musical upbringing. 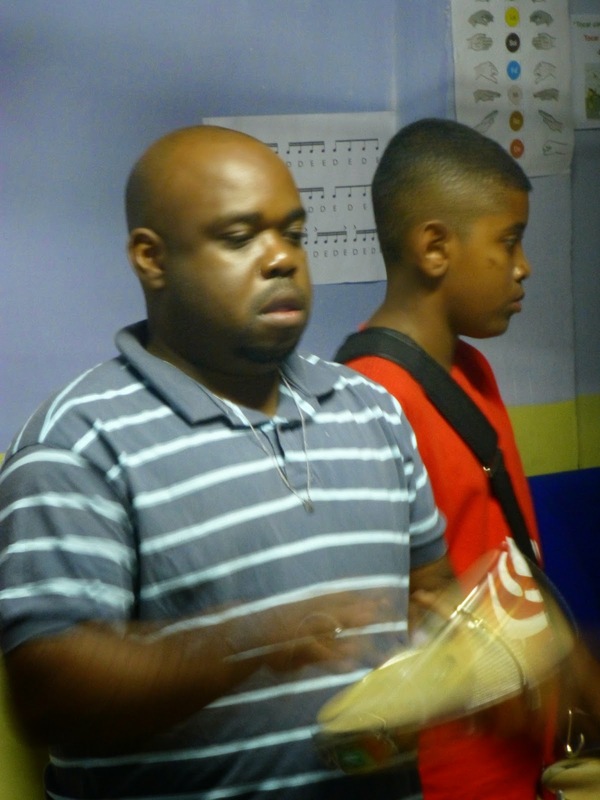 They'd have lessons on Mondays with Mangueirinha, a professional percussionist who's played with Seu Jorge and has years of experience teaching kids. They'd learn how to read music through figurenotes, an innovative and fun methodology that emphasizes shapes and words they already know to help them quickly decipher notes and rhythms. And they'd put this into practice on melodicas and mini-xylophones, which ease the transition to brass playing and give them a more visual understanding of music theory. My job would be the final step of introducing them to the trumpet. And after talking everything over with Tom during my visit, I immediately committed to the opportunity. So on a Friday afternoon, Ben and I packed our bags, leaving my place without a word to hopefully the worst landlord I will ever have to endure. The journey to Peireirão (the favela where Tom lives) was more stressful than anticipated, but after an hour-long trek and difficulty finding a cab, we finally made it, overjoyed by the view and the start of a new chapter. After snapping a few photos of the incredible sight of Pão de Açúcar and all of praia Flamengo down below us, we passed out on our comfy new mattresses, finally catching up on much needed sleep. The excitement felt at the time would only be exceeded. At around 6pm the following day, Tom leaned out the window with his trumpet and blew an emphatic horse race fanfare, as customary before every lesson to call the kids. Before I knew it, a nice crowd of about fifteen had shown up. I wasn't sure what to expect exactly, but I soon found myself in the kitchen helping Venicius and Victor, two of our most dedicated students, find their first notes. After some basic instruction and positive encouragement, they were getting a pretty good sound, especially Victor, despite it being his first day. By the end of the lesson, Victor could nearly play the entire B-flat major scale! I had goosebumps watching. And by day three, he and Venicius could play Cai Cai Balão together. As more kids started coming, Tom and I decided on a rotation based on ability level, age, and dedication. This constantly evolved as more came into the fold. But the main idea is that those who attend lessons consistently get a chance to play trumpet, and if they show real interest, get to take it home to practice. All kids from the favela are welcome and always have the opportunity to play percussion, learn to read music, and even perform. In essence, we try to keep the door open while cultivating potential talent, which isn't hard to come by. However, the more qualified volunteers we have, the better able we are to maintain to the balance between getting every kid involved and enabling the more advanced to blossom. We now have nearly thirty kids, of which 10-15 are coming consistently, and our most dedicated five are taking trumpets home to practice on. I did a mixture of private lessons and group rehearsals with the trumpet players, as well as new lessons for promising students. There are an additional five, who if they continue to come, will soon be able to take home a cornet and songbook, and hopefully join the top group. The ones that come less consistently still learn how to play percussion and participate in blocos (shows we do on the streets of the favela and the main futsal court). The kids were truly a pleasure to work with, and I rarely had any problems with discipline. Even when a problem arose, it was resolved quickly because the students genuinely wanted to be there. The beautiful thing about the project is that no one is being forced to come. And those who come regularly are rewarded with more opportunities. Tom and I constantly joked that we were much less dedicated as music students growing up. Maybe its because we grew up too privileged to appreciate such educational opportunities, or maybe because it was too forced upon us, but whatever the reason, I was in constant awe of the kids we taught. Unlike me at the age of 13/14, they even practice! For instance, one afternoon when I was heading out for a jog, Victor leaned out the window of his house with his trumpet and started playing Saints Go Marching In. Words couldn't describe the sense of pride I felt. In just two months, he learned all ten songs in the book and significantly improved his sound. His curiosity to learn was also impressive, as he drilled me with questions during our lessons and even tried to use his ear to figure out melodies. It’s kids like Victor who make me believe in our project, who make me feel like Favela Brass provides something more than just a distraction from the drug trade or the typical social project song and dance circle. This is an opportunity for these kids to grow musically and see the fruits of their own labor. Many have tremendous potential to become musicians, but regardless, this is about showing them what they can accomplish when they put their mind to something, while giving them memories they will cherish as they grow older. I was a little concerned about living in a favela. The one I lived near in Copacabana was ripe with tension. But Pereirao is a special community, one in which I felt much safer than in most parts of Rio. You are up in the hills of Santa Teresa, away from so much of the madness. And although there is a drug trade with traffickers on several corners, I rarely saw a gun or heard a shot. When I first moved in, I got questioned by the traffickers, but only to make sure I wasn’t a cop. Once they heard my gringo accent, their faces lightened up, and I never had a problem since. Beyond feeling safe, I became part of the community and spent much of the World Cup watching matches at the neighborhood restaurant. I got to celebrate with the locals, many being the parents of the kids we teach. Before every Brazil game, we performed with the kids. We marched down the main street of the favela playing classic Brazilian and soccer tunes on percussion and brass, and then finished the show at the restaurant. This was the culmination of my time with the project. Seeing my students put what we’ve been working on into practice, the smiles on their faces, and the joy in the eyes of their parents are memories I will forever cherish. I have just returned to the United States to do a master's program in Washington, DC, but there is nothing I want more than to know that the project will continue to prosper. If you're interested in volunteering or donating, please contact Tom through this website! Positive site, where did u come up with the information on this posting? doon global school I'm pleased I discovered it though, ill be checking back soon to find out what additional posts you include. Thank you to Longridge Band!